The #WomensWave is coming! This weekend marks the second anniversary of the 2017 Women’s March. On Saturday, January 19th marches are taking place in cities all across the US, including here in Washington DC. 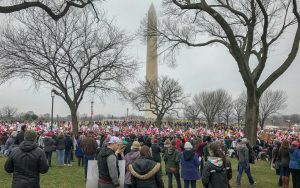 If you’re planning to attend the march in DC, make a difference for women who are working to overcome their homelessness by donating a metro fare card to Calvary Women’s Services. Donated fare cards will be distributed to women participating in our employment support program, Step Up DC. Step Up DC provides women with the resources to secure a stable income. Participants sharpen their resumes, research work opportunities, attend job fairs, and practice interviewing. Securing income is a key step for women as they move out of homelessness into independence. Join Elisa and others making a difference for women by collecting fare cards and sending them to Calvary. It’s the perfect way to cap off a weekend of lifting up women’s voices and highlighting women’s causes. Please include a gift message with your name and address for inventory and acknowledgment purposes. Questions? Contact Sandrine Uwera at (202) 678-2341 ext. 233 or suwera@calvaryservices.org. Thank you for supporting the women at Calvary!